Ducan Premium Concrete Driveway & Patio Glaze is a superior water-based driveway and patio sealer with an extreme high gloss, wet look shine. Can be used indoors or outdoors. 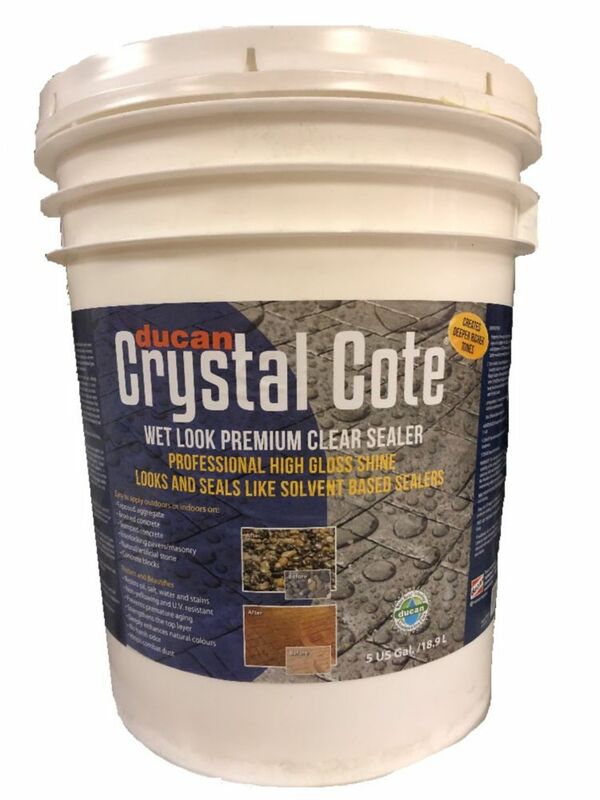 Ducan Premium Concrete Driveway and Patio Glaze provides a high gloss wet look shine and adds a protective finish to concrete, pavers, exposed aggregate and other concrete surfaces. Produces a darkening effect which leaves a deep rich tone. Protects against oil, transmission fluid, de-ice salt. Helps prevent pre-mature aging caused by rain, ice, snow, and UV rays. Creates deep rich tones on aggregate, pavers, concrete and other concrete surfaces. A specially-formulated stone sealer designed to penetrate and protect the surface of a polished, high-density natural stone such as granite. Provides optimum protection against grease, dirt, oil and water-based stains allowing for easy daily maintenance. A premium, water-based formula that is non-combustible. Low odour, pH neutral it can be used indoors or out, in commercial or residential applications. Allows moisture vapour transmission. Protects sanded and non-sanded grout. StoneSpecific<sup></sup> Low VOC (Volatile Organic Compound) formulas help provide better indoor and outdoor air quality compared to similar traditional products. 60 grams of VOC per liter of material. Color enhancer and penetrating sealer for all types of porous natural stone and grout. Rejuvenates the colour and appearance of worn, faded stone, tumbled marble and other rustic-look stones. Can also be used to darken the colour of grout. Provides long-lasting protection against oil, grease and stains. Its water-based, low odour formula can be used indoors or outdoors. StoneSpecific<sup></sup> No VOC (Volatile Organic Compound) formulas help provide better indoor and outdoor air quality compared to similar traditional products. A specially-formulated stone sealer designed to penetrate and protect the surface of a unpolished, low to medium-density porous, and roughly textured natural stone. These types of stone are highly susceptible to staining and Tumbled/Honed Marble, Travertine, Limestone & Slate Sealer is designed to provide optimum protection against grease, dirt, oil and water-based stains allowing for easy clean-up. A premium water-based formula that is non-combustible. Low odour, pH neutral it can be used indoors or out, in commercial or residential applications. Allows moisture vapour transmission. Protects sanded or non-sanded grouts. StoneSpecific<sup></sup> Low VOC (Volatile Organic Compound) formulas help provide better indoor and outdoor air quality compared to similar traditional products. 60 grams of VOC per liter of material. Aim and Seal Grout Sealer is a ready-to-use, water-based, penetrating sealer that resists most common oil and water-based stains. With a 3600 nozzle, it is a quick and easy way to apply a sealer to sanded or non-sanded grout while in a standing position. The steady stream from the nozzle and the foaming action of the sealer makes it easy to aim and seal. Premium Concrete Driveway & Patio Glaze is a superior water-based driveway and patio sealer with an extreme high gloss, wet look shine. Can be used indoors or outdoors. Ducan Premium Concrete Driveway and Patio Glaze provides a high gloss wet look shine and adds a protective finish to concrete, pavers, exposed aggregate and other concrete surfaces. Produces a darkening effect which leaves a deep rich tone. Protects against oil, transmission fluid, de-ice salt. Helps prevent pre-mature aging caused by rain, ice, snow, and UV rays. Premium Concrete Driveway & Patio Glaze is a superior water-based driveway and patio sealer with an extreme high gloss, wet look shine. Can be used indoors or outdoors. is rated 3.5 out of 5 by 2. Rated 2 out of 5 by Roman from Super slippery Applies well. Extremely slippery surface and does not provide a wet look at all. Not recommended. Rated 5 out of 5 by Sully from Excellent Product I purchased Ducan after returning another product that made a mess of my parents driveway. I still had my own driveway to do so I purchased Ducan. This product went on easy I used a lot and it still dried up beautifully.A few bucks more but worth the ten bucks. Can I apply Duca WATER base Acrylic exposed concret sealer over SOLVENT based Acrylic product applied 2 yrs. ago? Yes you can. It can be applied after the solvent based has been down for a year. What kind of coverage does it get stamped concrete paitio - smooth 18.9 liters will do how much?